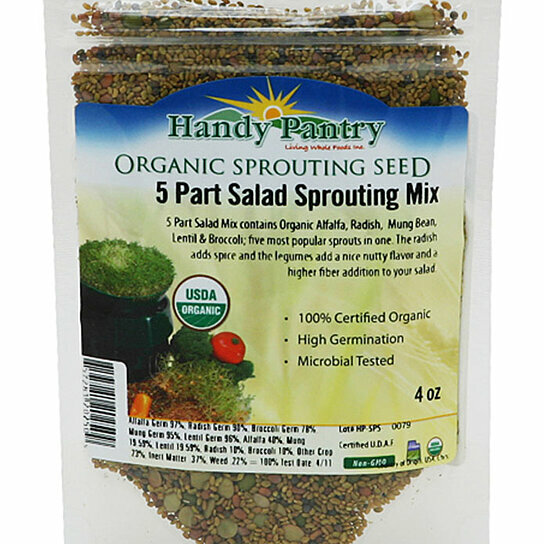 5 Part Salad Mix contains Organic Alfalfa, Radish, Mung Bean, Lentil & Broccoli. This mixture creates denser, higher fiber salad. Country of origin: USA. 1 Cup. Yields Approximately 5 Cups of Sprouts. USDA Organic. Prime Quality. High Germination. Certified 100% Organic. Certified U.D.A.F. Non-GMO. Country of origin: USA.